The debate surrounding the THAAD deployment exposes a bigger issue: the strategic dilemma facing South Korea and China. Xi reciprocated Park’s positive gestures and policies. When Park personally asked Xi to install a memorial stone in Harbin for a Korean independence activist who assassinated Japan’s then-Prime Minister Ito Hirobumi in 1909, Xi responded by not just installing a memorial stone, but establishing a memorial museum for the activist. More prominently, in 2014 Xi became the first Chinese president to visit Seoul prior to making a visit to Pyongyang. In the words of some analysts, the warmth in Sino-South Korean relations that had been limited to the economic sphere now permeated throughout the political sphere as well. Nevertheless, January 6, 2016, the day of North Korea’s fourth nuclear test, was a turning point in Sino-South Korean relations. 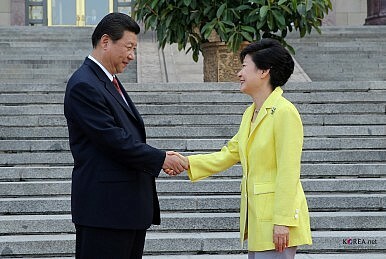 Following the test, Park repeatedly called Xi, but could not reach him at the other end of the line. According to some of her aides, she was visibly upset and disappointed. In the following days, South Korea quickly decided to deploy THAAD missiles and China responded sharply and excessively. China’s ambassador to South Korea Qiu Guohong stated that South Korea’s deployment of THAAD missiles would “destroy Sino-South Korean relations in an instant.” China’s Foreign Minister Wang Yi also indicated that South Korea’s decision to deploy THAAD missiles undermined the mutual trust between South Korea and China. China’s opposition notwithstanding, on June 9th, South Korea announced that it had decided to deploy THAAD missiles to counter the increasing North Korean nuclear missile threat. South Korea’s THAAD deployment and the rapid reversal in Sino-South Korean relations speak to the strategic dilemma South Korea and China face in Northeast Asia. China’s strategic dilemma is that it has to decide how much pressure to exert on North Korea. A high degree of pressure could further alienate North Korea from China and cause the Kim regime to act in ways that harm Chinese strategic interests. Even worse, unprecedented pressure on North Korea could cause the Kim regime’s downfall and a refugee crisis that would foster significant instability in China’s northeastern provinces. On the other hand, a low degree of pressure on North Korea could lead South Korea to distrust China and further enhance its alliance with the United States. This dilemma is most likely to worsen over time as North Korea continues to make strides in its nuclear weapons program and provokes South Korea more frequently. China’s indecision over whether to impose more stringent sanctions on North Korea will drive Northeast Asia to a more dangerous and uncertain future that is deleterious to Chinese strategic interests. On the other hand, South Korea’s strategic dilemma is that South Korea’s dependence on the United States for security could become incompatible with its reliance on China for its economy. This could lead to contradictions that require South Korea to sacrifice its economic interests for its security guarantees or vice versa. South Korea’s dilemma is also expected to worsen over time as balance of power in the Western Pacific gradually shifts toward China and away from the United States. Equipped with more economic prowess and military capabilities, China will become more willing defend its national interests and punish those who harm Chinese interests. Should South Korea make security decisions that harm Chinese strategic interests in the future, China may take advantage of South Korea’s economic reliance on China and incur significant pain in the South Korean economy. While China does not want South Korea to be further integrated into U.S. security arrangements in Northeast Asia, its inability to restrain North Korea is producing exactly that result, by strengthening the U.S.-ROK security arrangement directed against North Korea and potentially against China. China has repeatedly said it views the U.S. alliance system as an anachronistic byproduct of the Cold War and perceives U.S. security arrangements in the Asia-Pacific as a de facto containment strategy aimed to suppress China’s peaceful rise. China’s failure to restrain North Korea, however, resulted in South Korea’s decision to deploy THAAD missiles and reaffirm the U.S.-Korea alliance. Furthermore, given the improvements in South Korea-Japan relations since the comfort women agreement last year, South Korea’s increasing cooperation with Japan will further enhance the larger U.S.-Japan-ROK security arrangement in Northeast Asia. Some scholars and analysts suggest that China has changed its policy toward North Korea. China also claims that it neither condones nor tolerates North Korea’s nuclear provocations. Indeed, China has become less tolerant of North Korea and more supportive of U.S.-led sanctions, but this does not constitute a significant change for South Korea. From a South Korean perspective, North Korea’s continued nuclear provocations are a reminder that China has not fully used its economic leverage over North Korea to restrain its provocative behavior. Under this environment, China’s insistence that it has become more cooperative with South Korea on North Korean sanctions will only deepen South Korea’s suspicions over China’s sincerity in its diplomatic conduct and even engender mistrust between the two countries. Without a change in North Korean behavior, critics in South Korea and elsewhere will conclude that China has made insufficient commitments to sanctions or other tools to restrain North Korea. Accordingly, South Korea will view China as an unreliable partner on security issues and seek stronger arrangements with the United States and even Japan. In other words, South Korea’s decision to deploy THAAD actually reflects its disappointment at China’s inability or perceived unwillingness to restrain North Korea’s provocations and nuclear ambition. Indeed, China could impose more stringent sanctions on North Korea to restrain North Korea’s nuclear ambitions, but this would certainly further alienate North Korea from China and make it more willing to act in ways that harm Chinese strategic interest in the region. While China has considerable influence over North Korea, North Korea is not China’s proxy state and has the capability to independently make decision that can harm Chinese interests. China is also gravely concerned about the prospects of the Kim regime’s collapse. For one, the collapse of the Kim regime could result in a massive refugee crisis in China’s struggling three northeastern provinces, or even a war on the Peninsula. One study estimates that about 3 million North Korean refugees would cross the China-North Korea border in the wake of a North Korean collapse. Such a massive inflow of North Korean refugees will most likely devastate the regional economy and foster greater social instability. Another source of concern is that the new regime that arises out of the Kim regime’s collapse could hold favorable attitudes towards the United States and push the Korean peninsula toward a direction that is unfavorable to China. Given these strategic concerns, China will remain reluctant to impose harsher sanctions on North Korea despite its endless provocations and the latest nuclear test. In short, China’s challenge in the Korean Peninsula is that it must tame the untamable. In the wake of North Korea’s provocation, China needs to decide whether to impose harsher sanctions. If China decides to impose sanctions, it must bear in mind the prospects of a more antagonistic North Korea or even a regime downfall and a subsequent refugee crisis that would destabilize China’s northeastern region. On the other hand, should China decide not to impose sanctions, it must be aware that China’s inaction or inability to deter North Korea will further push South Korea into U.S. security arrangements in Northeast Asia and enhance what China perceives as an American containment strategy. This strategic dilemma will persist as long as the North Korean regime survives and continues its provocations against the South. South Korea faces a different dilemma in Northeast Asia. South Korea’s strategic dilemma is that its overwhelming reliance on China for its economy and dependence on the U.S. for its security could lead to contradictions that require South Korea to sacrifice economic interests for security purposes or vice versa. Since the normalization of diplomatic relations in 1992, Sino-South Korean economic relations have changed quantitatively and qualitatively. China is South Korea’s largest trade partner, and since 2010, the total size of Sino-South Korean bilateral trade has surpassed the size of trade that South Korea conducts with Japan and the US combined. The size of Chinese companies’ mergers and acquisitions in South Korea has reached an unprecedented level and its emphasis has moved from companies in the manufacturing industries to service industries, including insurance and entertainment. More important, due to the ratification of the China-Korea Free Trade Agreement in 2015, South Korea’s dependence on China is expected to increase to an even greater extent. While South Korea’s trade relations with China provides access to the world’s largest market and a reliable source for South Korea’s economic growth, its overwhelming reliance on China could become a strategic vulnerability if China decides to sanction South Korea for making a decision that harms Chinese interests, such as THAAD deployment. China’s response to South Korea’s deployment of THAAD is a case in point. Besides the unprecedented level of harsh rhetoric, the Chinese government has stopped the broadcast of Korean dramas and banned Korean celebrities from appearing on TV shows. China has abruptly canceled provincial officials’ visits to South Korea for cultural exchanges. Some travel agencies have questioned whether China’s decision to strengthen the requirement for Koreans to acquire multi-entry work visa in August reflected China’s discontent over South Korea’s THAAD deployment. Some may argue that China’s economic retaliations against South Korea have been minimal and should not be an issue of grave concern, but China’s reaction to THAAD may give an idea of how China will retaliate in the future if South Korea makes more decisions that harm Chinese strategic interests. An issue of greater concern is that South Korea’s strategic dilemma between China and the United States will intensify as balance of power in the Asia-Pacific continues to shift toward China. Numerous scholars and experts have already pointed out that this shift in balance of power in the Asia-Pacific region will foster greater instability and create a political and security climate that is more vulnerable to U.S.-China confrontation. Indeed, China and the United States have sharp disagreements in numerous regions in the Asia-Pacific that can potentially escalate to military conflict and especially in the Korean Peninsula where the United States and China backed different sides. As the Asia-Pacific develops into a more volatile environment, South Korea’s security considerations as a U.S. ally will sharply contradict with its economic interests as China’s largest trading partner, requiring South Korea to make painful sacrifices either in the economic or security realm. Much of the debate over South Korea’s deployment of the THAAD has been over minor details in the THAAD system. The real issue at stake, however, is China and South Korea’s strategic dilemma in Northeast Asia that is likely to persist and even intensify in the next few years. China will have to carefully balance the prospects of a more unstable and antagonistic North Korea and stronger U.S. security arrangements directed against China. South Korea will have to achieve a delicate balance between the United States and China as the Asia-Pacific increasingly becomes a contested region between the two powers. These strategic dilemmas for China and South Korea will continue to perplex Chinese and South Korean leadership and pose unprecedented challenges in strategic decision making. Benjamin Lee is a James C. Gaither Junior Fellow at the Carnegie Endowment for International Peace’s Asia Program.